Although Loughmore Castleiney GAA club didn’t really become an entity until the forties Gaelic games flourished in the parish since the founding of Cumann Luthchleas Gael in 1884. Now, more than three quarters of a century later, looking back with the benefit of hindsight, it would appear to have been a very pragmatic decision to join forces in ‘40, on what was then intended to be a permanent basis: Castleiney won the mid junior football final of 1938 but lost the county final to Emly. Promotion to senior ranks in 1939 resulted in a heavy defeat from Templemore Eire Og. Loughmore won the mid junior final of 1939 but suffered a similar fate to Castleiney when they lost to Ballingarry in the County Final. United for the first time in 1940 Loughmore Castleiney made parish history by winning the mid and county senior football titles. Because of the parish’s proximity to Thurles it is hardly surprising that clubs in Loughmore and Castleiney were among the first nine clubs formed in Mid Tipperary in 1885, one year after the Association’s founding. Teams from both Loughmore and Castleiney were among the seven mid- Tipperary teams involved in the first football county championship in 1887. Due to poor organisation and with championships not been completed the association showed signs of decline in the early 1890’s. This was probably a consequence of the political upheaval caused by the land war. The situation improved with the setting up of the new county board in 1894. In the senior football county final of 1895 Loughmore were defeated by Arravale Rovers, who later progressed to take Munster and All Ireland titles. Surprisingly there was no senior football team in the parish again until 1909 when Castleiney were one of three teams to contest the first mid football championship, which was won by Thurles. During the next decade teams from both Castleiney and Loughmore fielded in the senior football championship every year. Castleiney won the 1914 senior football mid and county finals. In the same year, they won the first junior football championship organised by the mid Tipperary Board. Castleiney-Templetouhy United also won mid titles in 1915 and 1919. Loughmore were united with Templemore during the second half of this decade. In the twenties, there wasn’t any senior football team in the parish but Jim Davy, Bill Ryan, Denis Mackey of Castleiney and Jim and Mick Ryan of Loughmore played with the Templemore senior football team that won the 1925 county final. Bill Ryan played senior football with Tipperary from 1914 to 1926. Jim Ryan played from 1917 to 1926. They were on the 1920 All Ireland winning Tipperary team and played on Bloody Sunday. Apart from Ballyduag, in the first decade of the 20th century, very little competitive hurling appears to have been played in the parish until Castleiney contested the mid junior final of 1923. They succeeded in winning the mid junior final of 1925. Three years later in 1928 Castleiney- Killea became mid senior hurling champions. Denis Mackey played on the Tipperary junior hurling team that won the Munster final in 1929. Although Castleiney and Loughmore amalgamated on a couple of occasions in the thirties they appear to have been only temporary arrangements. The forties was a much more successful period for the now united Castleiney-Loughmore team. The 1940 success was followed in ‘46 with county senior football honours and five divisional senior football titles were also won. Castleiney and Loughmore went their separate ways during the fifties. Loughmore contested six consecutive county senior football finals winning in 1955. In 1959 the parish had two senior football teams for the first time since 1887 as a result of Castleiney’s junior success in 1958. Loughmore came out on top when they met in the mid final of 1959 and the mid semi final of 1960. At the 1961 mid convention a rule was passed that only allowed one hurling and football club in a rural parish. Loughmore and Castleiney have been united since. The reunification did not bring the instant success enjoyed twenty-one years earlier in 1940. It was 1965 before the first senior football mid title was won and not until 1973 was the next senior football county title brought back to the parish. 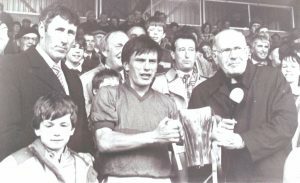 The seventies proved very successful for the club with three senior football county titles and three U-21 football county titles won. Two county minor doubles,’76 and ’79 were also achieved. The earlier minor/u-21 successes of the fifties and sixties had been diluted somewhat by amalgamation with neighbours, Moyne-Templetuohy. Juvenile titles both divisional and county were won for the first time. Having a successful juvenile club since 1970 has been the foundation for the many successes enjoyed at senior level. Sean Kearney and Eddie Webster won Railway Cup football medals with Munster in ‘74 and ’75. 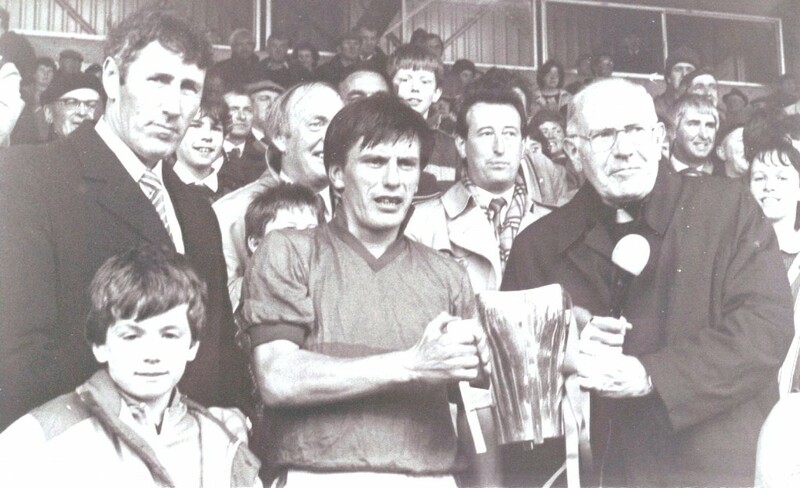 Eddie’s son Micheál became the club’s third Railway Cup medal winner thirty years later, this time in hurling. The eighties were to prove even more successful; winning the 1980 intermediate hurling county final gave the club dual senior status which has not been relinquished since. Two senior football titles, ’83 and ’87 and one senior hurling, ’88 were won. On two occasions ‘83 and ‘87 the elusive double was within a score of been achieved. In ‘89 Pat McGrath and John Cormack added senior all-Ireland hurling medals to their already considerable under-age collection at national level. Peter Brennan and Jim Maher were also all-Ireland hurling medal winners at minor and U-21, Jim in fact captaining the successful Tipperary 1980 minor side. In the nineties, a senior football title in ‘92 was the highlight. Ned Ryan brought distinction to the club and parish when he won a senior hurling al- Ireland medal in 1991. The new millennium started well with David Kennedy, Paul Ormond and Noel Morris collecting all-Ireland senior hurling medals in 2001. It was Paul’s 2nd Celtic Cross as he already had a junior football all-Ireland. The noughties brought two senior county titles to the parish also; football in ‘04 and hurling in ‘07. Club History was made in ‘07 when the Munster club hurling championship was won. The present decade has been very successful to date; Liam McGrath captained the successful all-Ireland minor football team of 2011. John Meagher, John McGrath and Darragh Butler also brought all Ireland medals to the parish on that great occasion. In 2012, it was Edward Connolly’s turn to bring an all-Ireland cup to the parish – Intermediate hurling on this occasion when Evan Sweeney also collected a medal. Four county senior titles have been won in this decade, so far. The historic double, achieved in ‘13 at the third attempt is another famous landmark in the club’s history. Back to back county football titles has been another first. The McGrath brothers brought great honour to the club in ‘16 when Noel and John won senior hurling all-Ireland medals and Brian captained the successful minor team on the first Sunday of September. It was Noel’s second senior medal and both he and John had enjoyed under-age hurling success with Tipperary already. They have also been recognised for all-star awards. The club can look forward optimistically but needs to guard against complacency. Since 1885 fluctuating fortunes have been very much in evidence in the parish’s G.A.A history.